Last Update 25.03.2019 This page in german! The Who is one of the most successful and well-known international rock bands. They belong to the first generation of English groups that are today still active. The Who was formed in 1964 by guitarist Pete Townshend. Their first names were 'The Detours' and 'The High Numbers'. Their first appearances took place in Shepherd's Bush, an outlying district of London. The Who soon made a name of themselves as the favorite band of the 'Mods'. This was an English youth movement of the '60s and could be identified by their short hair, well-groomed clothing, parkas and souped-up scooters. They brought attention to themselves through sometimes violent clashes with 'Rockers', mostly on weekends in the English seaside resorts. The music the Mods played was black, American soul and rhythm and blues bands, or also groups like The Who. The popularity of The Who also came from their energy-filled, aggressive live appearances. Of particular attention was Roger Daltrey pulling the mike to himself with lasso movements, or the way Townshend moved his guitar with such movements that it reminded one of a turning windmill. At many appearances, many parts of the set-up and instruments would end up broken. The unpredictable drummer Keith Moon and Townshend, also, were always there for these happenings. The destruction happened more or less by accident. In a later interview, Townshend tells about an appearance in a club with very low ceilings; without realizing it, he jumped too high and hit the ceiling, breaking the neck of his guitar. Since this event was so well-received, it became the group's identity symbol. The Who's first singles showed that the group had a musician that could write songs that were above average in Pete Townshend. Songs like 'I Can't Explain', 'Substitute', 'My Generation' or, later, 'Baba O'Reiley', 'Pinball Wizard' or 'Won't Get Fooled Again', are classics of rock music. The Who became the international attraction that they are today, first of all, with 'Tommy', a 'rock opera' from Townshend. 'Tommy' became an institution; there have been presentations in opera houses and theater; A movie version was made, and for several years, The Who, as a group, could not be separated from these productions, something that they themselves did not like. They broadened their activities. For example, their own films, such as the documentation 'The Kids are Alright', or 'Quadrophenia' were realized. Individual band members fulfilled solo projects: John Entwistle undertook a tour with his own band, and Roger Daltrey made his mark as an actor in different movies. But The Who stayed together. They count amongst the most popular live bands from the '70s and played long tours, especially in the USA, to umpteen thousand fans. The concerts were always full of energy and surprises. On records (such as 'Who's Next' and 'Quadrophenia'), Townshend proved that he was not at a loss of words for good songs and concepts. It was also he that showed in many interviews and in other statements that he had absolutely no desire to just retire or to live off of old successes. The group was not ready to give up as The Who, even after the death of one of their founding members, Keith Moon. A new line-up was formed with drummer Kenny Jones, and the keyboard player, Jahn 'Rpicst' Bundrick. Townshend has been actively and intensively taking care of the new development in English rock music in recent years, and still sees The Who as a group that can still give exciting concerts. The England tour showed that also, where The Who has been playing since early 1981. A large part of their repertoire comes from new songs; the on-stage performance doesn't have much in common with typical superstar behavior. That's not without planning. To that, Townshend says: "As a rock band, we are on tour in 1981 because we want to play to an audience that has fun with good rock'n'roll." The members of The Who, though, are more devoted to their solo projects. Townshend released the LP, 'Empty Glass', Daltrey played in movies and Entwistle recorded his 5th solo LP. 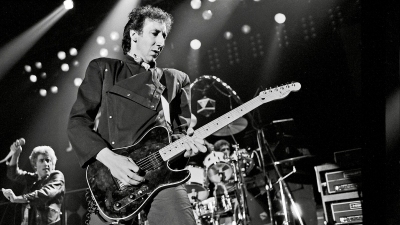 After the release of the LP 'It's Hard', and a US tour, Townshend announced the dissolution of The Who. The last appearance in Toronto was used for a TV documentation and the live LP, 'Who's Last'. In 1985, The Who played together for the first time for the Live-Aid Concert. For their 25th anniversary, they gave a US tour with 43 appearances. That led to a new edition of 'Tommy', with Billy Idol, Elton John and Patti LaBelle, which showed up as CD, LP and video. In 1996, The Who could be seen at a presentation of 'Quadrophenia' in London's Hyde Park, for the benefit of the Prince's Trust. The concert's success led to The Who going on tour with 'Quadrophenia': In 1996 in the USA, and in 1997 in Europe. In Germany, Quadrophenia could be seen 5 times. Zak Starkey, the son on Ringo Star, played the drums, and Townshend's brother, Simon was the guitarist. 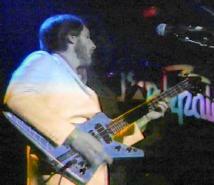 On June 27, 2002 John Entwistle died during the USA tour. After 24 years Who's Townshend and Daltrey published a new Who Album "Endless Wire" in 2006. "At the occasion of a rehearsal in the London Rainbow, Peter met Pete Townshend. A long discussion developed, during which it came out that Townshend had seen the live airing of the last Rocknacht, with Graham Parker, The Police and Jack Bruce on English TV. For him, that was the only possibility to go on TV: Only live. Peter was impressed in the discussion by Townshend's concentration. He listened very carefully and wanted to know everything in exact detail. They noticed that right away in Essen. One always had the feeling that he had a large interest in learning something new, and to exchange himself with others, which stood in contrast to his to his position as the central man of a rock institution. - Christian visited some concerts of the English tour and came to the conclusion that The Who '81 was a completely normal rock band that had good and bad days. When you watch a complete concert from this group, it soon becomes clear on how few single details a myth can be built upon. No way did they constantly do sommersaults and throw around the microphone." OMNIBUS Music-Books, London 1995, Paperback,112 Seiten, ca. 88 Abb. London 1996 Paperback,168 Seiten, ca. 400 Abb. PETE TOWNSHEND AND THE DEEP END - Midem Cannes 29.01.1986 more Pete links are here! The Who & Special Guests DVD - Live at Royal Albert Hall - order at Amazon ! The Who - Quadrophenia & Tommy, Live 3 DVDs - order at Amazon ! GRATEFUL DEAD is a rock band from San Francisco, USA, with a 15-year history (1981 - the complete history is about 30 years). The members of the band got themselves together through the initiative of guitarist, Jerry Garcia, in 1965. After many line-ups and names like 'Mother McCree's Uptown Jug Champions', or 'The Warlocks', Grateful Dead's final line-up took hold with Jerry Garcia, Bob Weir (rhythm guitar, song), Bill Kreutzmann (drums), Ron 'Pigpen' McKernen (keyboard), and Phil Lesh (bass). As with many other musicians at that time, Grateful Dead also attempted to newly define American rock music. The most important goal of this band was to entertain their audiences with good live concerts. From the very beginning, Grateful Dead was the band that was most closely associated with the happenings in San Francisco, which, even nowadays, are still falsely described with slogans such as 'Haight Ashbury', 'Flower Power' or 'Acid Tests'. The group considers itself to be a collective which wants to contribute to the realization of another American dream. Grateful Dead gave innumerable free concerts or used their income to support the most unusual alternative organisations. They were the local band in San Francisco. In the beginning, they thought of themselves musically as "somehow an electric rhythm and blues band". They increasingly developed their own style, which, on the one hand, was made up of multiple voice harmonies and, on the other hand, was made up of long, drawn-out instrumental improvisations. The Grateful Dead's repertoire started out with well- known rock'n'roll standards together with adaptions of country songs. Working together with all the members of the band, Robert Hunter, a poet and songwriter, helped the Grateful Dead write their own songs. Robert Hunter still writes most texts for the group and is mostly responsible for the development of their own style. Grateful Dead concerts were and are cultural events. They usually last from 3 to 4 hours. After the group made a record contract in 1967, the name Grateful Dead also became known internationally. Tours, equipped with considerable technical expenses, followed. In spite of this expansion, the group held onto it's principle as a collective: The work tempo was not fixed by commercial interests. The group's tours were a money losing job. Another example of the good connections between the group and their fans is the setting-up of their own fan base, the 'Dead Heads', through which the group communicates steadily and directly with it's fans. The innumerable reactions and inquiries that came in to the Rockpalast staff after the announcement that the Dead would be appearing at the next Rockpalast-Nacht (28 March, 1981), show how widely distributed this fan base is in Europe. In the mid '70s, the Grateful Dead turned to another project: A movie about themselves. 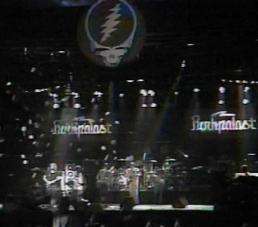 Live concerts were taped in 1974 and l975, and the premiere of the two- hour long documentary took place one year later. On the side, the individual members fulfilled solo projects. On top of records, new bands were formed, such as 'The Jerry Garcia Band', or 'Kingfish'. Other projects and bands, like 'The New Riders of the Purple Sage', which had already been around for a while, were worked on more. After these outings, the musicians decided at the end of the '70s to do more things together under their common name. They released records that showed that the Dead, even after 15 years, still counted amongst the most important and best bands in the USA. Since that time, the group undertook once again extended tours. Grateful Dead concerts are now, as before, still events that last many hours and are visited by constantly increasing numbers of fans. Grateful Dead's appearance will be the only one on the European continent. Between their 1972 tour and today, the group undertook only one trip outside the USA, to give a concert in front of the pyramids of Gizeh (Egypt). The reason for that was very simple: They wanted to play there simply because the atmosphere of this historical place was so impressive. 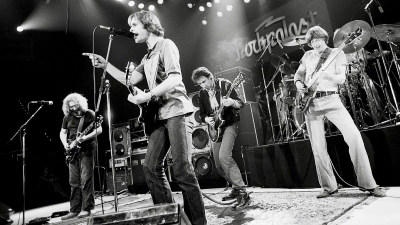 Grateful Dead's appearance before millions of fans at the Rockpalast-Festival on March 28th,1981, will surely be quite an event, since they always regard meetings between their world views and their audiences as special. Just the announcement that the group doesn't want to play for less than 3 hours already sets the conditions for a special night. 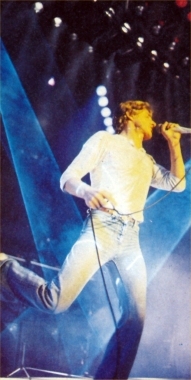 The 1981 tour was kept on two live albums. The Dead regularly toured through the states in the following years. The group controlled the Dead Imperium themselves, such as ticket sales, etc. In 1986, Jerry Garcia fell into a coma that lasted many days, brought on through drug rehab and diabetes. The end threatened. Miraculously, Garcia did recover and in 1987, after seven years, the Deads were back with their first studio LP. The LP 'In the Dark', became the most successful record till then, and also went platinum. On August 9th, 1995, Jerry Garcia unexpectedly died from a heart attack. "The Dead had decided to begin the European trip. We returned to London. Closing talks were standing. An appointment at 3 p.m. in a hotel with a view onto Hyde Park. Rock Scully asked us into his place, the Hostility Suite, rented for this purpose. There were more rooms were nobody lived in. The meeting between the Dead and the outside world took place here. The guests were entertained; the group knew that that was a starting point. Whoever wanted, could come by. Bill Kreutzmann and his son were the first ones to appear. They were watching a rugby game on TV. The next one was Bob Weir, who had just finished his round of jogging in the park. 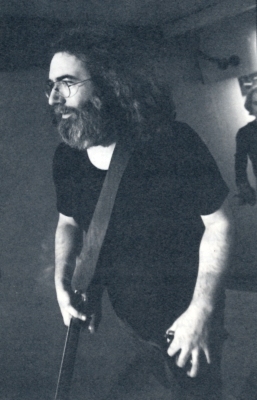 Then, Jerry Garcia too. Idea. "Yes, good, it will definitely be great. We want appearances like that. I've got to go in the next room quickly." He spoke, disappeared, and was not to be seen anymore in the next hour. We continued the talks over other different points and then had the chance to talk with Garcia, Weir, Mickey Hart and Phil Lesh about their appearance in Essen. We wanted to plant an acoustic bug in their ears. The reaction showed us that one important reason for the long existence of the Dead are the different opinions in this group. Weir found our idea good, Garcia didn't at all. Conflicts between the two of them; for us, it was a little painful, then, the Grateful Dead's solution: "Let's wait till we're in Essen." With that, Garcia was out of the room again. At their rehearsal in Essen, the Dead tried to fulfill our wish for an acoustical part. It didn't work. They would have had to re-do too much equipment. Back to electrical parts. Two numbers. Then the news came to the broadcasting van: Because of the bad acoustics in the empty hall, they didn't want to rehearse anymore. Two numbers out of an expected four-hour concert seemed very little to us. We wanted to continue. Jerry Garcia took a camera headphone: "I don't think that it makes any sense to continue. If we play now when it's no fun for us, then that's going to work negatively on our 'vibes' Saturday. We don't want that and surely you don't either". After another attempt to convince them of the necessity of rehearsing another half- hour, we gave up. The Space Captain had won. - At the concert. A historical moment: Pete Townshend couldn't take it. He had to get back on-stage to jam with the Dead. It is four o'clock in the morning: Not Fade Away." From: 10 Jahre Rockpalast (1985). Note: I don't know if there is an complete discography anywhere, because of the tons of bootlegs, the Dead's always allowed to tape there concerts! Weir Here                          (2004) Hybrid Rec. An Oral and Visual Portrait New York 1985 Paperback,192 Seiten, ca. 100 Abb. New York 1990 Paperback,256 Seiten, ca. 400 Abb. London 1996 Paperback,120 Seiten, ca. 50 Abb. New York 1996 Leinen, 240 Seiten, ca. 100 Abb. Second Edition Petaluma (USA) 1996 Paperback,172 Seiten, ca. 50 Abb. New York 1995 Paperback,128 Seiten, ca. 50 Abb. London 1988 42 Seiten, ca. 20 Abb. New York 1999, Leinen, Rehister, Bibliographie, 498 S., 30 Abb. New York 2003, Paperback, 272p. New York 2000, Paperback, 330p. New York 1999, Linen, 267 p.
The Grateful Dead Movie [2 DVDs] - bei Amazon bestellen! The Grateful Dead - Fare Thee Well [2 DVDs] - bei Amazon bestellen! Dead Set Original Recording Remastered, Doppel-CD - bei Amazon bestellen! The Best of the Grateful Dead Live Doppel-CD - bei Amazon bestellen!